On February 20, in the Hedo district of Kunigami, human remains were found in a burial urn in the tomb of the Ryukyu king Gihon. On February 20, a representative of the Kunigami Education Board announced that five or six sets of human remains and some ornaments have been found in the Hedo district of Kunigami in a burial urn in the tomb in which Gihon, a king of the Ryukyu Islands who was the third and last of the Shunten Lineage, is believed to have been buried. Although there are several tombs believed to belong to Gihon in Okinawa, progress in technology means that there is now a greater chance of proving Gihon was buried in the tomb in Hedo. That same day, the board opened the tomb to the public for the first time. Gihon was born in 1206 and assumed the throne during the Gusuku period of the Ryukyu kingdom in 1249. From the next year, Gihon’s reign was marked by a series of terrible disasters, including famine and epidemics that led to the death of nearly half of the population. He appointed a young lord by the name of Eiso as a regent (sessei) to manage state affairs. Eleven years after that, Gihon gave up the throne in favor of Eiso. It is believed that Gihon abdicated and withdrew into the forest alone because of the devastation in the kingdom and the change of lineage. There are several tombs believed to belong to Gihon in Kunigami and Kitanakagusuku. 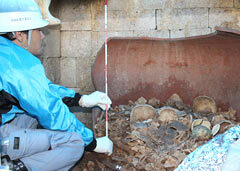 The human remains were found in an urn about one meter in diameter. It appears that the urn was placed inside before the tomb was completed because the urn is bigger than the entrance to the tomb. Shinya Akamine, a curator of the board who is investing the tomb, said that when the members of the board opened the tomb, the urn was found broken on the side, where the human remains were exposed. They found ornaments around lying around it. It is reported that members of the Sho family that ruled the Ryukyu Kingdom from early in the 15th century through to 1879, renovated the tomb during the early Meiji period. The tomb is three meters by three meters, and is made of Ryukyu limestone. The members of the board will continue to analyze the human remains and the urn, including trying to determine its age. The municipal government will restore the tomb this year, and plan to make it into a sightseeing spot.